Bamboozled February 2, 2017: Buyer beware… at your library? We often say “buyer beware,” and remind consumers that it’s important to know a company’s return policy or a service provider’s terms and conditions. But we never thought consumers would have to watch out for fine print from a public library. 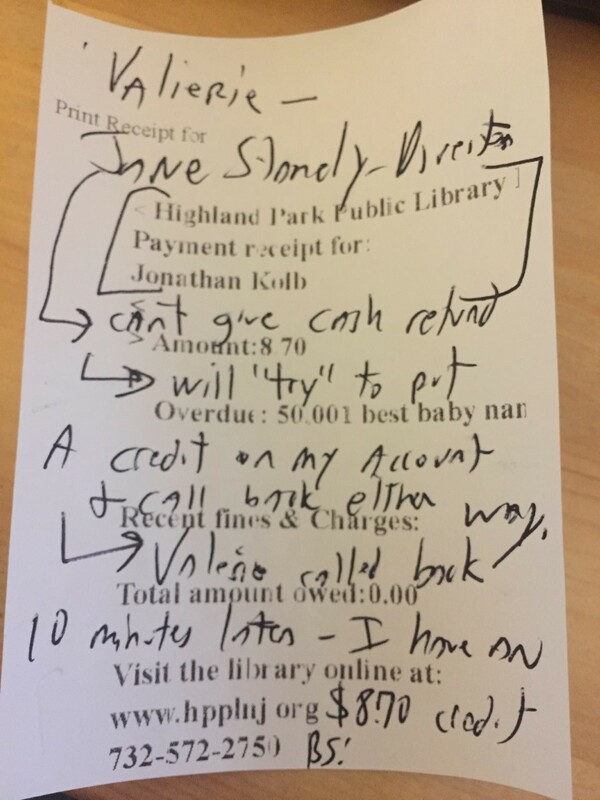 Jonathan Kolb learned that the hard way when he recently visited the Highland Park Public Library. Kolb went to the library to check out a book on Jan. 17. The librarian scanned Kolb’s library card and found he had an overdue book. It was “50,001 Best Baby Names,” a book Kolb borrowed so he and his wife could choose a name for their first baby, who is due in May. The late fees totaled $8.70, Kolb said he was told. When he returned home, he said, he looked everywhere for the book but couldn’t find it. So he called the library back to say he was sure he returned the book, and he asked them to look again, he said. Indeed, the librarian found, Kolb did return the book on time on Dec. 19, 2016. “They stated they had made a mistake in assessing me a late fee — 30 cents a day for the last 29 days,” Kolb said. Kolb asked for a refund of the $8.70 fee. Kolb asked for a supervisor and spoke to an employee named Valerie. Kolb asked to speak with Valerie’s supervisor, and he was connected to Jane Stanley, the director of library services. The “accounting practices” would not allow her to give a cash refund, Kolb said he was told. The library said it would try to credit his account the $8.70. Frustrated, Kolb agreed. Ten minutes later, Valerie called back, apologized and said Kolb’s library account had been credited. But Kolb wasn’t satisfied. It wasn’t a refund, and he’d only see that money again if he incurred more late fees — something he wasn’t planning to do. Kolb asked Bamboozled for help to recover the funds. We reached out to the library and three hours later, Stanley, the library director, responded. She said it’s the library’s policy to deny refunds on money that’s already been paid. And indeed, that’s exactly what the library’s circulation policy says: “Fines cannot be refunded once paid. If there is any question that a book may have been returned, no payment should be made until the issue is resolved,” it said. So, Stanley said, library staff left a message for Kolb to say there’s $8.70 in an envelope waiting for him at the circulation desk. We asked Stanley via email why the library had such a policy, but she didn’t respond. Kolb said he did get a message from Valerie, saying the money was waiting for his pickup. “She left a message saying they `reached into our own pockets for you’ and `we want to give you the money,'” Kolb said. So was this a refund, or did employees pay the money to make Kolb go away? We asked Stanley, but she didn’t respond to that, either. At least Kolb got his money back, but the library seems to have some unexplained accounting policies we’d love to learn more about. There’s one more surprise to come from this story: The Kolbs are still looking for the perfect name for their baby. We’re happy to share your suggestions with the family.